Should Christians consider Islam a serious challenge to Christianity? Or, should Islam just be viewed as another road to the same God? One of our guest speakers was Kerby Anderson. Mr. Anderson is the National Director of Probe Ministries International. He holds masters degrees from Yale University (science) and from Georgetown University (government). He is the author of several books. He serves as the host of a radio program called "Point of View" which is broadcast nationally. Mr. Anderson next explained the difference between the Sunnis and Shiites, the two major divisions within Islam and two groups who are constantly in conflict with each other. He next focused in on an analysis of the differences between Islam and Christianity, which is where we're going to pick up with below. His presentation made it crystal clear that Islam is a false religion that worships a false god and teaches a false plan of salvation, namely salvation through good works. Islam denies the Trinity. It denies the atoning sacrifice of Jesus. And, it denies the grace of God. There is no doubt about it — Islam is a religion that is totally incompatible with Christianity. What I want to try to do is challenge you to think about the issue of Islam, because it is one of the greatest challenges of the 21st Century. Wouldn't you agree? I'm going to do my best if you've never really studied this too much to give you enough basic information so that by the end of this you have at least a basic understand of what Islam is all about, what the challenge is, and how to respond to it. I also recognize that some of you have actually studied this subject and have some background, so I will also try to drop in at least enough information so that even if you are an expert on this subject maybe you will learn a few things that I believe are going to be really relevant. First, let's back up a few years and talk about a book that I think really sets in context why it is important for us to understand this issue of Islam. Samuel Huntington is the author of a book written back in the late 1980's or early 1990's. He first wrote an article that appeared in Foreign Affairs which later became the book called The Clash of Civilization. He was a professor at Harvard University and I've shared the podium with him before. Huntington during the time when the Berlin Wall was falling and there was no longer an actual Soviet Union was pointing out that many people were making false predictions when writing books on the end of history. These authors were claiming that all the conflict was going to go away as there was no longer a Soviet Union. They believed the conflict between the West and Communism would end. Well, that didn't quite work out. Huntington also predicted that in the 21st Century he believed there would be a clash of three major civilizations. The first is what he called Western Universalism, what we would describe as the West and Western culture governed by rule of law, Constitutional government, and one person one vote. Those are all the kinds of things that we take for granted in the West. The second civilization he referred to as Chinese Assertion. We're not to forget the more than a billion Chinese. But, I won't really spend too much time talking about these first two. We'll focus on the third civilization that Huntington talked about, what he called Muslim Militancy. Now, by that he didn't mean that all Muslims are militant. He didn't mean that all Muslim countries are militant. But, he did predict that one of the greatest challenges the world would face in the 21st Century would be a clash between the West and Islam. Was he right? Yes, he was. I understand there are some that have said that the Battle of Gog and Magog from Ezekiel 38 and 39 destroys radical Islam. Maybe that's the case, and maybe it's not. But, the bottom line is that for now we have to face the threat of radical Islam. By this I don't mean that all Muslims are radical and I don't mean that all Muslims are terrorists, that's simply not true. But, it's pretty much true that all terrorists are Muslims, and so we have to understand that. At the same time, I also want to help you understand that many of the Muslims you come into contact with, like the ones I run into when I go onto a college campus, they are here perhaps not with any kind of radical intent, although I suspect some are. Many just simply want to come and enjoy the American experience. Followers of Islam are worshipping a false god and so have a false worldview. So, let's spend a little bit of time covering this very significant threat to Christianity. It would be worthwhile if you had some time somewhere for you to at least read one chapter of the Koran. You don't have to go out and buy a Koran like I have. You can go online and get it, or you can go to a library and read it right there. I was going to suggest that if you only read one chapter just to understand a little bit about Islam I would suggest you read chapter 9, or as referred to for the Koran Surah 9. The reason for this is that first of all it was one of the last chapters written. There's this belief in Islam called "abrogation," that later revelation can abrogate or change previous revelation. So, you might as well read the end of the book, just like I'm sure that some of you have read mystery novels where you read the last chapter before you read the first. When you read the last chapter of the Koran first it will help you understand the concept of jihad. You would run into jihad in just the first 35 verses, as they portray four different claims for jihad. Let's take one. This is known as "the verse of the sword." Surah 9:5 says, "Fight and slay the pagans wherever you find them and seize them and beleaguer them and lie and wait for them in every stratagem." This comes from one of the more respected English translations of the Koran. I have looked at many and all of them say something very much like that. Does that give you little bit of an idea of the Islamic worldview? If any Muslim today says, "This is binding on me today and I need to follow this," can you see the concern that you may now have? Now, many Muslims are like a number of Christians. You know people who say, "I'm a Christian because I was born in America and I haven't killed anybody, so I must be a Christian. I go to church once a year, sometimes twice, if I really feel motivated." They don't really know their Bible, and a lot of Muslims I've run into in this country don't know their Koran either, or they contextualize it and say, "Well, that applied to Mohammad's day, but it doesn't apply to today." But, if you take a literal interpretation of Surah 9:5, should that concern you? I'm not just loading the gun. Let me give you another verse. Surah 9:29 commands, "Fight those who believe not in Allah nor the Last Day, nor hold that forbidden which hath been forbidden by Allah and His prophet, nor acknowledge the religion of Truth, even if they are of the People of the Book, until they pay the jizya with willing submission, and find themselves subdued." Okay, there are lots of things going on in Surah 9:29. First of all, it talks about the "People of the Book." Who are the People of the Book? Mohammed was talkng about the Jews and the Christians. Surah 9:29 also says that interestingly enough the People of the Book might not have to be treated like infidels, but they have to be treated like second class citizens. They have to feel themselves subdued. On my radio program "Point of View" we spend some time talking about persecution of Christians around the world. Where do at least two-thirds of our examples came from? They come from Muslim countries. Christians in Islamic countries have to pay the jizya which is like a poll tax. Historically, that was something they were required to do. Just look at the history of Islam and how Muslims when they took over an area the way they treated Christians, and churches and things of that nature. You'll get the idea. Surah 9:29 ultimately gives you the source of why the Muslims battle all those who are non-Muslims, and why they are fighting against anyone who is not a Muslim. It's common to hear this excuse made for Islamic jihad, "Well, okay, the Koran only has some verses about violence and just a few verses about jihad." In truth, though, there's not just a few, but about 100 of them. There are about 100 verses or parts of different Surahs that command the destruction of all non-Muslims! 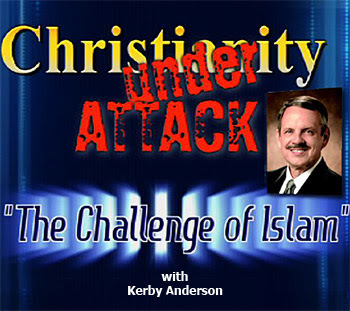 In the next segment on the challenge of Islam, Kerby Anderson addresses the difficult point skeptics of the Bible bring up concerning God's command to destroy the Amalekites and compares it to the Koran's command to destroy all non-Muslims. The article said "Followers of Islam are worshipping a false god and so have a false worldview. So, let's spend a little bit of time covering this very significant threat to Christianity." I think you are just afraid of the word Islam and Muslim. You need to get past that and you may find some insights about Christianity in there. I do not worry much about Islam for I believe it will soon be dealt a deadly blow as Isaiah 17, Psalm 83, and Ezekiel 38 & 39 find fulfillment! 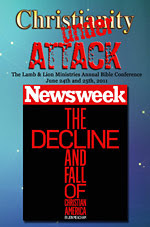 The rising threat of Islam will suddenly come to a crushing defeat by the hand of the Lord God! Israel is the threshing floor and Islam and all enemies that gather themselves against it are the chaff!